Insult Swordfighting: Get to the point! I feel kind of dumb for saying it after reading this, but I actually really loved the whimsical cast of Skyloft. Everyone had a personality (even if they're just anime stereotypes) and you can go into their rooms and see that they're all uniquely decorated. I thought the opening was funny and fun in a way that Twilight Princess was not and it reminded me of the goofiness of Wind Waker, which is my favorite 3D Zelda. Maybe I'm a sucker, but I was pulled in by the silliness and I loved the first two hours. Contrast it with Skyrim which started big, but I've been super bored with. There's no atmosphere to that game. The attempts at photorealism just drive it so deep into the uncanny valley that I feel super disconnected from the game mechanics and everything is SO BORING. All the lore, every conversation, etc. Hey, to each their own! The more I think about it, the more I am starting to wonder if the world building is what has kept me from enjoying the 3D Zeldas. There is something I have always found off-putting about the characters and the locales, ever since Ocarina. Maybe it's as simple as that. Re: Skyrim, that is exactly what is keeping me from playing it. The other problem with the "it improves after x number of hours" argument is, I would argue, that almost anything becomes more fun after a massive time investment. Because after that time you invest something of yourself into the process. Listen to the worst album in your collection for ten hours and you'll start to enjoy things about it. The Witcher 2 was criminal in this regard. I'm surprised more people didn't call it (Edge magazine was the only review I saw that marked it down for this), but I suspect since game reviewers 'have' to play the game until the end, they don't tend to criticise slow starts. I totally agree. I challenge you to name a game Nintendo has published in the last 5 years (excepting the mainline Mario games) where you haven't had to press A to get through torrents of text before you could start playing and get to something interesting. 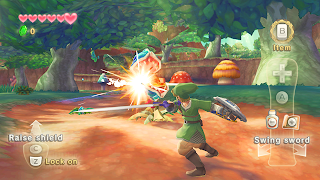 I'm a gamer, and so while I agree overall that for someone like myself, the "challenges" seen at the beginning of Skyrward Sword defy the meaning of the word, I do think Nintendo has put themselves in a rough spot. They're painted into a corner. They've advertised their console and games to nongamers. They've told them: "It's okay to be a nongamer, because we'll take care of you." and "You don't need to be a gamer to enjoy what we make." These not-so-subtle statements make serious (and I use that word in context of Nintendo's products, not gaming in general) products very difficult. They still want to bring the same universal appeal to a wide audience, but also don't want to sacrifice the nuance and verve of a title that doesn't compromise challenge. I think they're doing the only thing they can do, albeit rather ungracefully. I think that games do get off some what easy for not starting off with a bang. For whatever reason, it seems to be expected that there will be something of a slow start. I suppose this is from tutorials and the gradual difficulty curve every game but Dark Souls has. I agree that this is a ridiculous assumption. If a game hasn't grabbed you in the first hour, then that's a problem. It doesn't mean that the game is instantly awful, but it is certainly a big negative mark. Six hours is a lot of time to invest before something is interesting. I'm really curious about the world-building comment though. Are you saying that because 3D worlds are getting larger and more intricate that they're putting you off? I agree, to each his own, but I personally love exploring these places. This is especially true of Skyrim, where I would argue that exploration itself is the key to the game play. It wasn't a general comment -- I got completely hooked on Fallout 3, for example. I just have never liked the character design or the look of the worlds in the 3D Zeldas. I really find the characters to be grotesque and off-putting, whether they are allies or villains. As a potential solution to this problem, I wonder why more developers don't add a "I've played this type of game/the prequel before, skip the intro/tutorial stuff and drop me where the fun starts" button. It wouldn't be hard to include in-game narrative justifications for this. It's way more important than "After cryogenic unfreezing/waking from a coma we need to see if you can look up and down in order to calibrate your xyz suit thingy". I actually had a chance to participate at the demo panel here in Toronto. I really don't know what to expect from future Zelda games based on this one! LOL!